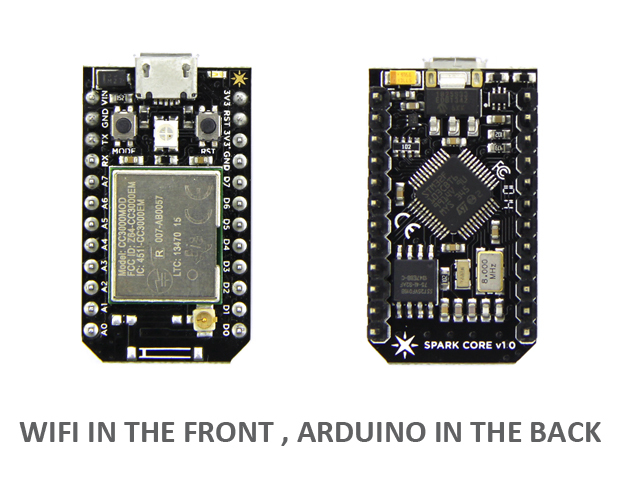 The Spark Core is an Arduino-compatible, Wi-Fi enabled, cloud-powered development platform that makes creating internet-connected hardware a breeze. This little board packs a punch: with a 72 MHz ARM Cortex M3, the best Wi-Fi module on the market, wireless programming, and lots of pin outs and peripherals, there's nothing you can't build with the Core. Now we have Spark core with two connectors, Chip Antenna and u.FL connector, Besides, we get Shield Shield that converts the foodprint and pins into Arduino, making it compatible with all of your existing Arduino Shields and accessories. And we get Spark Maker Kit which contains all the necessary hardware components to get you started with building simple Internet enabled projects. Enter your network name and password into the Spark App and press OK.
That was it. Seriously. You’re connected. The Spark Core makes first-time configuration of your devices a breeze for both creators and users. The Core includes a brand spankin' new Wi-Fi module: the CC3000 from Texas Instruments. It features their unique setup process called Smart Config that allows makers and developers to bring their creations online in seconds. The Core is already Wi-Fi connected, so we've decided to do away with wires altogether. * You can program your new software in our web development environment or in your favorite text editor, and with a single click, Spark Flash delivers updated firmware to your project over the web. Spark Flash means that your projects stay in their enclosures, out in the field, and in the hands and homes of users, where they belong. It also means that your creations can be easily changed, updated, and improved over time, without worrying about USB ports and programmer pins. For more product information and technical support, please contact hello@spark.io.